The Cialla Valley is a small casket surrounded by woods and suspended between the Adriatic and the Julian Alps. The succession of hot and breezy days to cool nights create the optimum conditions for the perfect maturation of the grapes. The area has always been renowned for the production of excellent wines not only white but also red. 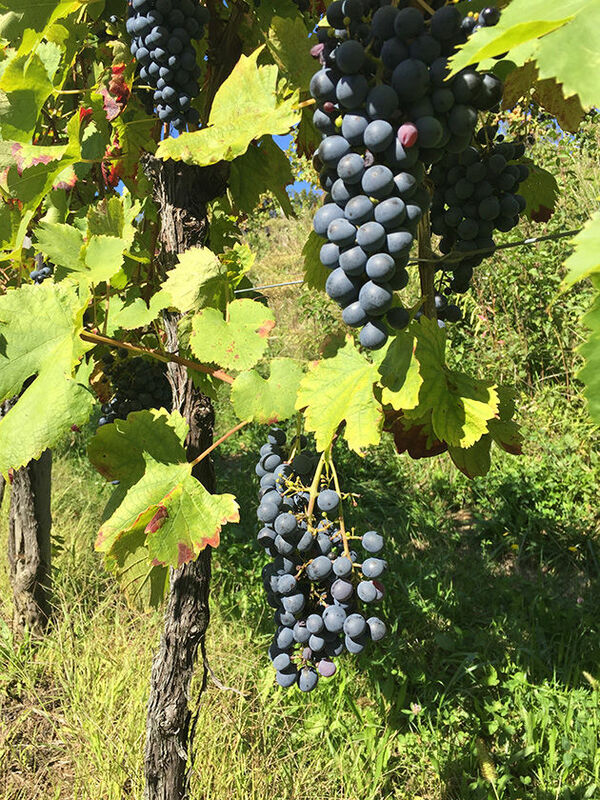 Since the Middle Ages, there have been reports on the cultivation of Schioppettino, locally called sclopetin or Ribolla Nera, and the wine, produced in limited quantities, was sought after and renowned for its rarity and quality. The Schioppettino, historically, was cultivated on an area of land limited to a few square kilometres. It was in fact common knowledge at the time that, if cultivated outside its area of origin, the Schioppettino would lose part of its finesse and spicy characteristics that made it unique. For centuries, the Schioppettino was cultivated in Cialla and in the neighbouring area of Prepotto. For centuries, the Schioppettino was cultivated in Cialla and in the neighbouring area of Prepotto. In the middle of the nineteenth century, with the advent of phylloxera (a phytopagus parasite of American origin that attacks and jeopardizes the root apparatus of the vine), the Schioppettino was almost completely destroyed. The winemakers of the time had no way to preserve some specimens from destruction: the variety was cultivated on a very limited territory that was not spared by the parasite. At such a crucial time in our wine history, we thought to replace the native varieties and to introduce the most famous French vines, much easier to cultivate and more productive. A rich documentation on this topic can be found by leafing through the various vintages between 1890 and 1930 of the periodicals of the Friulan Agrarian Association (organ of the Agricultural Institutions and of the Provincial Technical-Agrarian Commissions of Friuli and the Agrarian Society of Trieste). In the face of its millenarian history, at the end of the 1960s, the Schioppettino had almost disappeared and was considered extinct by bureaucrats who did not even put it in the list of varieties allowed to be grown. In Cialla, in 1970, a small miracle happened: Paolo and Dina Rapuzzi founded the winery Ronchi di Cialla and, thanks also to the help of Bernardo Bruno, then mayor of Prepotto, managed to find about 60 surviving vines of Schioppettino. Selecting the best gems from the shoots, they made new cuttings and managed, in the space of two years, to create a first wine estate of 3,500 vines that marked the rebirth of the Schioppettino. As a recognition of so much work and foresight, in 1976, the Rapuzzis were awarded the prestigious Risit D'aur Prize (Barbatelle d'Oro), the first edition, of the Nonino distilleries of Percoto for the following motive: "... for giving rational impulse to the cultivation, in its most suited habitat in Cialla of Prepotto, of the ancient and prestigious native vine Schioppettino, of which absurd laws had decreed the extinction... ". 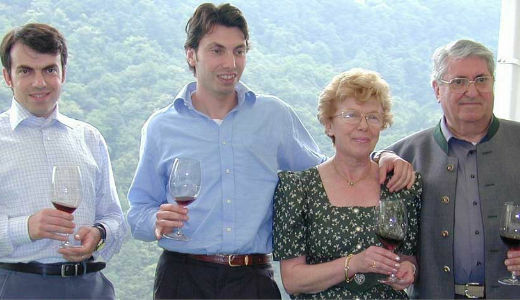 In the jury, there was also Luigi Veronelli who fell in love first with the story and then with the wine Schioppettino. After more than forty years, the Schioppettino is sold and appreciated all over the world. Many vintages, kept in our cellars in Ronchi di Cialla, have been subjected to topping up. The Schioppettino, from an extinct grape, thanks to Ronchi di Cialla and to the Rapuzzi family, is experiencing a rebirth and a renewed period of popularity. The founding of the company Ronchi di Cialla by Paolo and Dina Rapuzzi. From the start, the company’s philosophy was to cultivate only indigenous Friulan vines and to obtain great ageing wines. The choice of the Schioppettino was immediately obvious because the Cialla Valley offers ideal conditions. Historical articles from the thirteenth century spoke of the Schioppettino as one of the most prized varieties of the commune of Prepotto’s territory, abandoning it would have been a crime against the cultural and historical heritage of Friuli. In addition to the practical problems related to the recovery of the scions destined for the grafting of the first 3500 vines, there were considerable bureaucratic problems because the prospects were those of a criminal complaint and a forced removal of the vineyard. In fact at the beginning of the 1970s, the juridical position of this vine was severely compromised. It did not even appear in the category of varieties to which cultivation was allowed. The Rapuzzi vineyard received the first “Risit d’aur” award for bringing Schioppettino back into his natural habitat of Cialla di Prepotto in a rational way, in spite of the absurd laws stating its extinction. In the same year, its cultivation was declared legal again. On March 14th, a legal statement with the results of the 1977 vintage was released and made available to the press and connoisseurs confirming 35 hectolitres of Schiopettino had been produced and were currently fermenting before being poured in wooden oaks of 225 litres each to age for 6-8 months. According to this document, the texture of the liquid was remarkable and let foresee the wine distinguished character. The geographical boundaries of the original schioppettino’s valley of Cialla are established. Schioppettino became DOC Colli Orientali del Friuli. On the basis of the Law 164 was published in the Official Gazette no. 278/95 the disciplinary code of the Cialla. Until now this company ( Ronchi di Cialla ) is known as the only one in Italy that produces wines from 5 native wineyards Schioppettino, Refosco from the Red Peduncolo, Ribolla, Verduzzo and Picolit. On January 12th, the 1986 and 1988 Schioppettino di Cialla were auctioned at Christie’s in New York along the best Italian and French brands. 19th and 20th of May 2001 in the presence of a public notary, the company Ronchi Cialla issues the “1st Call for topping up” for the prestigious vintages Schioppettino 1985’s and Verduzzo 1983’s. The Calla Company proceeded with the operation of refilling a limited number of bottles: some owned by Rapuzzi family , and others owned by other customers. June 8th marked the 25th anniversary of Schioppetino’s rebirth. Its evolution was displayed in a tasting for a selected experts commission through 6 signature vintages (’77. ’80, ’83, ’85, ’90 and ’98) which received a very positive feedback. The experts were impressed with the ever growing improvement of the product and the enhancement of its expression due to the long ageing periods. 10th May 2003 “2st Call for topping up” . In the presence of a notary and of Rapuzzi Family are topped up: Schioppettino, Refosco dal peduncle Red, Picolit and Verduzzo vintage 1977. The refilled bottles are property of the Ronchi of Cialla and of their most prestigious clients.